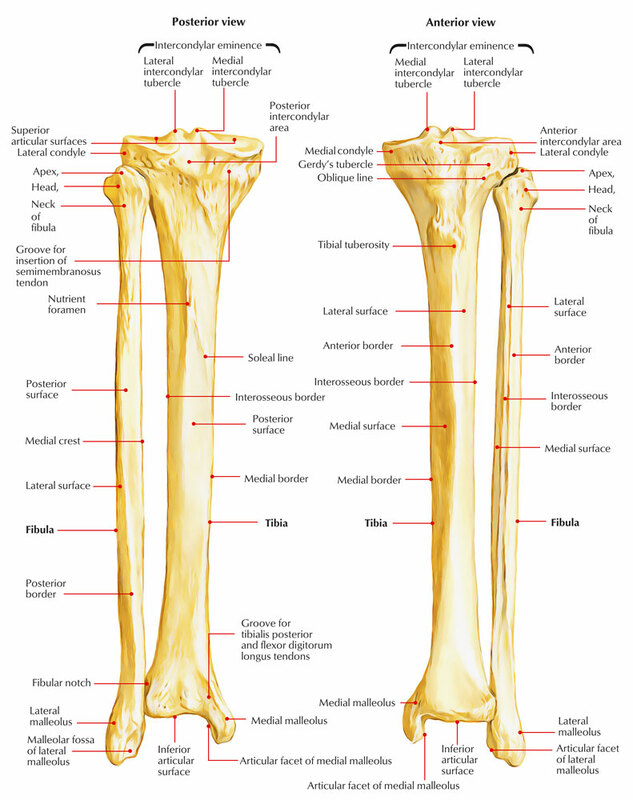 The Fibula is the lateral bone of the leg and is homologous with the ulna of the forearm. In Latin, the term fibula means “pin”; therefore the lateral bone of leg is rightly referred to as fibula because it’s a long pin-like bone. It’s a long thin postaxial bone of the leg and will not take part in the transmission of the body weight. It gives attachments to muscles. Its lower end together with the lower end of tibia creates a socket (tibiofibular mortise), to hold the talus set up. The fibula is a long bone and is composed of 3 parts: upper end, lower end, and interceding shaft. The upper end (head) is round and presents a circular articular facet. An upward projection posterolateral to this facet is termed styloid process. The shaft is described to have anterior, interosseous, and posterior edges; and medial, lateral, and posterior surfaces. Nonetheless, only interosseous border is clear cut; other edges and surfaces gyrate so that it’s hard to establish. Not one of them stays only in the position indicated by its name. For that reason, making an effort to identify them is just wastage of time. The lower end is flattened and bears a triangular articular facet on its medial surface for articulation with all the talus. Behind and below this is really a roughened fossa termed malleolar fossa. Its round end termed head is directed upward. Its comparatively flattened end is pointed downward. A triangular articular facet on its lower end faces medially. A depression at the lower end (malleolar fossa) is located behind and below the triangular articular facet at this end. An oval or circular articular facet on its superior aspect for articulation together with the lateral condyle of the tibia. A styloid process posterolateral to the articular facet which gives connection to the fibular collateral ligament. A sloping surface in front of the styloid process for C-shaped insertion of biceps femoris. Neck It’s a constriction below the head, linking it with the shaft. The common peroneal nerve is associated with the posterolateral aspect of neck and anterior tibial artery on its medial aspect. The shaft shows considerable variation in its form because it is moulded by the muscles attached to it. It has three borders—anterior, posterior and interosseous; and three surfaces—medial, lateral and posterior. The anterior border begins just below the anterior aspect of the head. At its lower end it divides to enclose an elongated triangular area which is continuous with the lateral surface of the lateral malleolus. The posterior border is rounded. Its upper end lies in line with the styloid process. Below, the border is continuous with the medial margin of the groove on the back of the lateral malleolus. The interosseous or medial border lies just medial to the anterior border, but on a more posterior plane. It terminates below at the upper end of a roughened area above the talar facet of the lateral malleolus. In its upper two-thirds, the interosseous border lies very close to the anterior border and may be indistinguishable from it. It gives connection to the anterior intermuscular septum of the leg in its upper three-fourth. It starts just below the anterior aspect of the head. Inferiorly it divides to enclose a triangular area, which continues on the lateral surface of lateral malleolus. Superior extensor retinaculum is connected to the anterior margin of the triangular area and superior peroneal retinaculum to the posterior margin of triangular area. It goes from the posterior aspect of head to the lateral margin of groove on the posterior surface of the lateral malleolus. 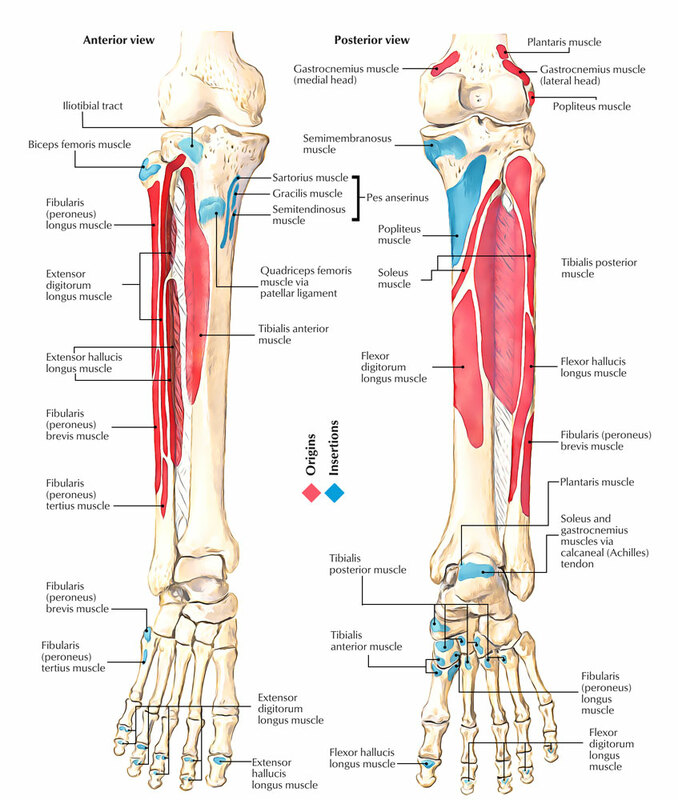 Posterior intermuscular septum of the leg is connected to its upper three fourth. It is located close and just medial to the anterior border (divided from it only by 3 millimeters in the upper part). Inferiorly it finishes at the upper end of the roughened area for the interosseous ligament. 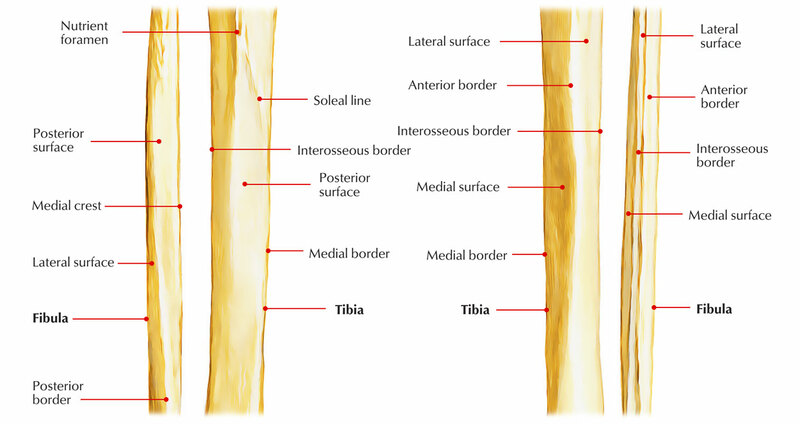 Interosseous membrane is connected along its entire length with the exception of at the upper end to make a gap for the passage of anterior tibial vessels. The medial surface lies between the anterior and interosseous borders. In its upper two-thirds, it is veiy narrow, measuring 1 mm or less. The lateral surface lies between the anterior and posterior borders. It is twisted backwards in its lower part . The posterior surface is the largest of the three surfaces. It lies between the interosseous and posterior borders. In its upper two-thirds, it is divided into two parts by a vertical ridge called the medial crest. It’s narrow and is located between the anterior and interosseous edges. It gives origin to extensor digitorum longus in upper three-fourth (entire width of its upper fourth and anterior half of its middle 2-fourth). Extensor hallucis longus originates from the posterior half of the middle two-fourth medial to the extensor digitorum longus. Its lower quarter gives origin to the peroneus tertius. It is located between the anterior and posterior edges. Peroneus longus originates from the upper two-third (whole width of upper one-third and the posterior half of the middle one-third). Peroneus brevis originates from the anterior half of its middle one-third and entire width of its lower one-third. It’s wide-ranging and is located between the interosseous and posterior edges. Its upper two-third is split into medial concave and flattened lateral parts by a sharp vertical ridge medial crest. Fascia covering the tibialis posterior is connected to the medial crest. Medial concave part gives origin to tibialis posterior. Lateral flattened part gives origin to the soleus in upper quarter and to the flexor hallucis longus in lower three-fourth. Peroneal artery descends along medial crest. Nutrient artery, a branch of the peroneal artery, enters the nutrient foramen present just above the middle of the posterior surface. Alimentary canal is pointed downward. The lower end of fibula is enlarged anteroposteriorly to form lateral malleolus, which presents 4 surfaces anterior, posterior, medial, and lateral. Anterior surface is rough and round. It gives connection to the anterior talofibular ligament. A notch at its lower border gives connection to the calcaneofibular ligament. Posterior surface presents a groove, which lodges tendons of peroneus brevis and peroneus longus, the latter being superficial to the former. Medial surface presents a triangular articular surface in front and a depression (malleolar fossa) below and behind it. The upper part of malleolar fossa gives connection to the posterior tibiofibular ligament and its lower part to the posterior talofibular ligament. Lateral surface is triangular and subcutaneous. For the upper end: Appearance: 3-4 years. Fusion with all the shaft: 20 years. For the lower end: Appearance: 1-2 years. Fusion with all the shaft: 18 years. In fibula, law of union of epiphysis is broken [cf. according to this law, epiphyseal (secondary) center which seems first unifies last with the diaphysis. In fibula, epiphyseal center for lower end seems first and also unsites first] The explanation to this infraction is the fact that epiphyseal center in the lower end of fibula appears before because it’s pressure epiphysis and in the upper end afterwards because it’s traction epiphysis. Since the growing end fibula is its upper end (as evidenced by the path of nutrient foramen) it unsites with the diaphysis last in spite of the fact that its epiphyseal center also seems last. Since the fibula doesn’t take part in the transmission of body weight, it’s a common source of bone for grafting. The upper and lower ends of the fibula are subcutaneous and palpable. The common peroneal nerve can be rolled against the neck of the fibula. This nerve is commonly injured here. 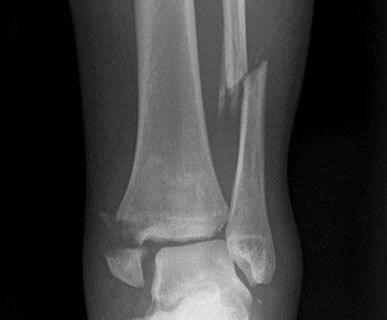 In the first stage of Pott’s fracture, the lower end of the fibula is fractured spirally. Though it does not bear any weight, the lateral malleolus and the ligaments attached to it are very important in maintaining stability at the ankle joint. The fibula is often fractured, 2 to 5 cm proximal to the distal end of the lateral malleolus. It’s commonly related to ’fracture dislocation of the ankle joint’.